CrossFit Level 1 Certificate Courses: CrossFit Park City, CrossFit Hawaii, CrossFit Lackland, Valley CrossFit, CrossFit Morristown, CrossFit SoCal, CrossFit Fury, CrossFit X-Factor, CrossFit Federal Hill, CrossFit King of Prussia, CrossFit Centrum, CrossFit Thames, CrossFit FRA, Reebok CrossFit Louvre, CrossFit Auckland, CrossFit at HGST, Shenzen, China, CrossFit Chiwoo, CrossFit EMOM Villa Luro, Jauria CrossFit. CrossFit Level 2 Certificate Courses: Peak 360 CrossFit, CrossFit TNT, CrossFit Steele Creek, CrossFit NOLA Downtown, CrossFit Calgary. 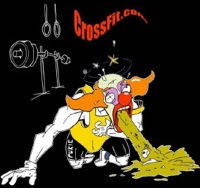 CrossFit Kids Courses: CrossFit SAC, CrossFit Reebok Nurnberg.